1. There are two things to keep in mind when interpreting a proverb: 1) the general rules of Bible interpretation, and 2) the identification of the type of structure of the proverb. A. There are no contradictions in the scriptures. i. No verse of scripture can be privately (separated from the rest of the body of scripture) interpreted (2Pe 1:20). iii. The public body in context is the scripture. iv. Therefore, no interpretation (explanation) of a prophecy (divinely inspired utterance or discourse) of the scripture can be withdrawn or separated from the rest of the body of the scripture, for to do so would create contradictions. B. Words should normally be defined with primary meanings. i. When interpreting a verse, the words should be read distinctly (in a distinct or separate manner; separately, individually, severally) and the sense should be given (Neh 8:8). ii. Sense - The meaning or signification of a word or phrase; also, any one of the different meanings of a word, or that which it bears in a particular collocation or context. iii. The meaning (the primary meaning) of a word should be used by default unless to do so creates a contradiction or an absurdity, or the particular collocation or context of the passage makes it obvious that a secondary meaning is being used. C.	Scripture should be compared with scripture to understand scripture. i. The Bible is written so that the information on a given topic is scattered "here a little, and there a little" all through the scriptures (Isa 28:9-10). ii. This is how God organized the Bible to teach us doctrine (Isa 28:9). iii. All the information on a given topic is not given in one verse, so almost always one verse must be compared with other verses to get all the information. iv. This is how the Holy Ghost teaches, and so ought we (1Co 2:13). D.	Reference texts must be distinguished from proof texts. i. A proof text expressly states a point of doctrine. a. An example of a proof text would be Joh 5:24.
b.	Joh 5:24 states that a person who presently believes the gospel presently has everlasting life and his passing from death unto life happened prior to that (is passed is present perfect tense - something that happened in the past and continues into the present). ii. A reference text refers to a point of doctrine but does not expressly define it. The point must be proved elsewhere. a. An example of a reference text would be Rom 10:13.
b.	Rom 10:13 states that a person who calls on the name of the Lord shall be saved. Since the Bible speaks of more than one type of salvation, the question then needs to be asked, "Saved from what?”. c.	The text doesn't say what type of salvation is being spoken of; it merely refers to a salvation. d.	Therefore, it would need to be compared with other texts to define what salvation is under consideration. E.	Pay attention to the context of the verse in question. i. Text without context is pretext. ii. Consider to whom the book or epistle was written. iii. Was it written to an individual, a church, or the entire human race? a. Don't read 1Co 12:27 and conclude that the entire human race is the body of Christ. b. Don't conclude that "all believers" collectively the body of Christ. c.	The epistle was written to the church at Corinth (1Co 1:2), and therefore the text is stating that their local church was the body of Christ. d.	Then it can be deduced that each local church is the body of Christ. v.	Always read at least ten verses around the verse in question before beginning to interpret it. A.	Solomon's proverbs are usually comprised of two parts which are joined together by a colon, a semicolon, or a comma, and generally involve a comparison between two statements. B. The two clauses of a proverb are often linked together by conjunctives such as and, but, and so. C.	Occasionally, a proverb will be only a statement of truth that contains no comparison. D.	In order to properly interpret a proverb, it is first necessary to identify its configuration. i. Contrasting - The clauses of the proverb are joined by a colon, semicolon, or comma followed by the word but. a. The meaning of such a proverb can be understood by contrasting the two clauses and focusing on their difference. b. The second clause will often explain the first by showing its opposite. ii. Comparison - The clauses of the proverb are joined by a colon, semicolon, or comma followed by the word and. a. The meaning of such a proverb can be understood by comparing the two clauses and focusing on their similarity. iii. No conjunction - The clauses of the proverb are joined by a colon, semicolon, or comma, but no conjunction is used. a. This configuration can be used with a comparative or a contrasting proverb. iv. Statement of truth - Some proverbs do not follow the two-clause model, but are simply a statement of truth with no comparison or contrast. 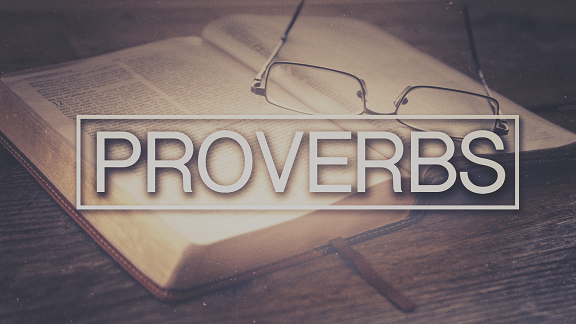 F.	Recognizing these distinctions in the proverbs will aid us in properly interpreting them.